Diffusion of the built form into the landscape defines the approach for situating this single family residence on a coastal bluff overlooking a natural canyon and the Pacific Ocean. 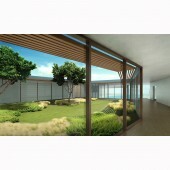 A balance between the negotiation and mitigation of a severe topography, integration into a diverse built context, and an attempt to preserve the natural beauty of a virgin site bordered by State park land was sought to inform the building’s siting/orientation and formal/material description. 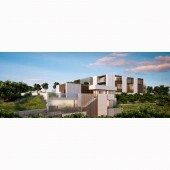 The building’s design is characterized by the appropriation and connection of two open terraces; one semi-public – related to the outward expression of the home as it addresses the landscape, and the other private – related to the inward relationships of the most discreet areas of the home. The building’s geometry is further organized by three principal axes: one directly oriented towards the view of the sea, the second constrained by the address of the adjacent property line, and the third responding to the curvature of the natural topography as it bends and moves up the canyon. The program is divided into two principal masses; a two story + partial basement main residence and a separate two story accessory building containing a gymnasium, guest quarters, and a recreation room overlooking a play court nestled into a natural grove of existing trees on the lower hillside. Each portion is interned into the hillside; terracing with the natural contours of the site, breaking up the overall readable mass of the building while using its sub-grade structure to reinforce the hillside. Over 70% of the existing two acre site is to be maintained as planted terrain incorporating a landscaped grove of over 200 new trees planned in addition to other drought tolerant plantings which will utilize drip irrigation to conserve water, compliment the native fauna, and encourage indigenous wildlife. The building volumes are organized for optimal opportunities for natural lighting and passive ventilation. 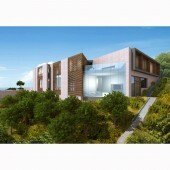 Situated at the upper end of the site, the natural flow of the landscape will direct sea breezes towards the home. Large openings assist in drawing the movement of air through the home in addition to the employment of a variety of shading, irrigation, and resource efficient strategies to help address natural cooling, solar protection, and energy and material conservation. Thermal benefits are expected for portions of the building which are subterranean. A planted upper courtyard will not only break up visibility of the upper roof, but actually make it seem as if it is a further extension of the surrounding park land. This architectural project is in direct and symbiotic dialogue with its site. Each referencing the other to determine layout, form, material, stability, and ultimately the longevity of the delicate relationship. In practical terms, the design utilizes several ecological features to help mitigate its carbon footprint while achieving a quiet elegance which draws from the natural attributes of the location and enhances its character. A limited yet pure palette of sustainable materials includes split face and honed stacked limestone, ipe wood slats, and large areas of high performance glazing. The 17,000 sqft (1,580 m2) residence occupies a 2 acre (8,100 m2) site including a 14,500 sqft (1,347 m2) primary residence and a 2,500 sqft (232 m2) accessory building. 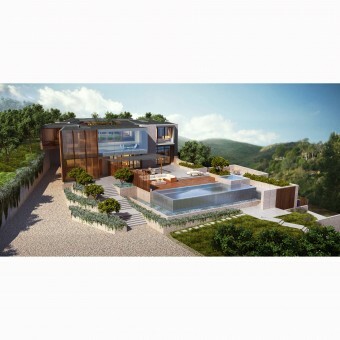 A 6 car garage is hidden within the main residence against the hillside and the second level of the home includes a 1,700 sqft (164 m2) upper exterior courtyard. Hillside, Subterranean, Terracing, Ipe Slats, Screens, Stacked stone, Natural, Preservation, Energy Efficient, Material Efficient, Resource Efficient, Sustainable, Natural topography, California, Los Angeles, Pacific Palisades, Courtyards. The team researched the natural characteristics of the site including natural light, wind direction, dominant and particular views, natural features, and visibility outwards from and to the site from the adjacent hillsides. The objectives in this research were to arrive at a unique design which satisfied the client's needs while maximizing available features and aspects on site to help define the form, material description, and outward expression of the home. An integrated mixture of hand sketches, 3D BIM modeling, physical modeling, and rapid prototyping were employed to develop the design from a number of perspectives. Detailed studies were conducted at different stages of the design to study many aspects at different scales and representations ranging from material collages and rapid prototyped design iterations, to full scale foam, stone, glazing and operable screen mockups. Negotiation and appropriation of a challenging and unstable topography. Much attention was given to the maintenance and utilization of the natural aspects of the hillside site to embed the design into the landscape in a way that did not violate the natural beauty and profile of the terrain, but also served to reinforce it both structurally and in a way that adds something formerly missing from the site with respect and restraint. Shubin + Donaldson Architects, 2011. Pacific Palisades Residence Single Family Residence by Shubin + Donaldson Architects is a Nominee in Architecture, Building and Structure Design Category. · Click here to register today inorder to be able to view the profile and other works by Shubin + Donaldson Architects when results are announced. Pacific Palisades Residence Single Family Residence by Shubin + Donaldson Architects is Winner in Architecture, Building and Structure Design Category, 2011 - 2012. · Press Members: Login or Register to request an exclusive interview with Shubin + Donaldson Architects. · Click here to register inorder to view the profile and other works by Shubin + Donaldson Architects. Did you like Shubin + Donaldson Architects' Architecture Design? Did you like Pacific Palisades Residence Single Family Residence? Help us create a global awareness for good architecture design worldwide. Show your support for Shubin + Donaldson Architects, the creator of great architecture design by gifting them a nomination ticket so that we could promote more of their great architecture designs.